Hello Dave and Buster’s at Del Amo Fashion Center! Aside from sports and games; there is also food! A wall at the new Dave and Busters sums it up perfectly! It says “We’re the fun place that’s serious about food.” Just like like their game offerings, Dave and Busters does not mess around with their food offerings. One of their best deals is there “BFFs Best Food Friends” offerings. Through BFFs, Dave and Busters combines some of their popular items like Philly Cheesesteak Sliders and Goldfingers. Crispy hand breaded chicken tenders with house made buffalo ranch sauce plus four sliders with thin slices of grilled Philly ribeye steak and melted cheese along with seasoned French fries await diners at Dave and Busters! Fun, food and more…. Dave and Busters at Del Amo will be sure to bring smiles to all! For more smiles, please see my recent Yelp review on Dave and Busters. Hello Kitty Cafe Truck Cuteness at Del Amo Fashion Center! A little over two years ago I was one of the first to ever to try the Hello Kitty Cafe Truck at Hello Kitty Con and it truly made me happy and giddy! 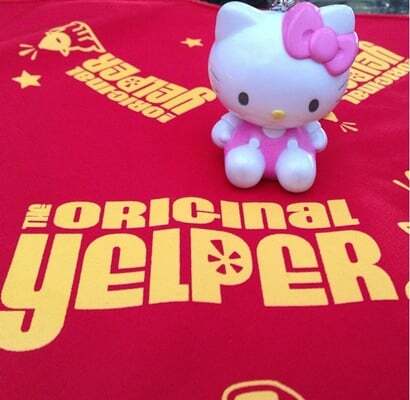 That happiness overflowed in my blog post and on the first ever Yelp review of the Hello Kitty Cafe. How can a Hello Kitty Foodie like me not love this truck? The Hello Kitty Cafe Truck is the very first ever food truck for Sanrio. The pink hello kitty truck is a truck oozing with cuteness and sweetness. Hello Kitty Foodies can get donuts, macarons, petit cakes and even hello kitty bow water bottles! When I heard the Hello Kitty Cafe Truck was making an appearance at Torrance at the Del Amo Fashion Center, I was super excited. Torrance is my hometown and Del Amo Fashion Center is one of my favorite places to visit. (This is no secret to my blog readers who follow my Del Amo adventures at eateries like Frida, Great Maple, Din Tai Fung, Lemonade and Brio). My favorite Hello Kitty Cafe truck was finally coming to my favorite shopping center. 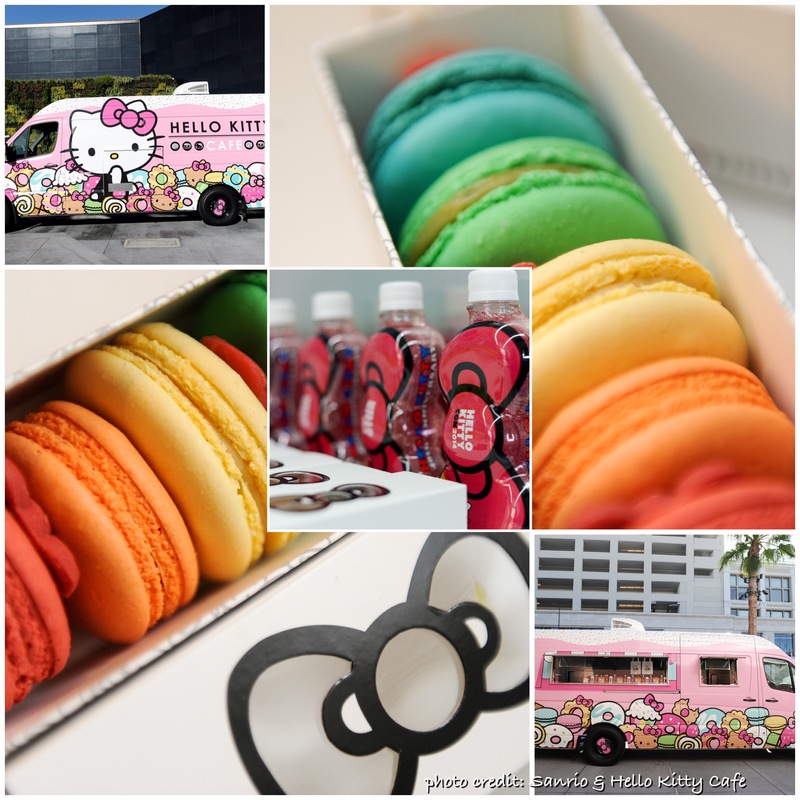 Hello Kitty Cafe Truck + Del Amo Fashion Center = happiness! The Hello Kitty Cafe Truck arrived bright and early on this happy Saturday morning. They were parked near the AMC theater. Beep beep! HK Cafe finally was in the South Bay! Happy Hello Kitty foodies from around the South Bay and beyond were there to see the cute kawaii truck. All of the Hello Kitty Cafe Truck’s signature and special kawaii offerings were there for every one to purchase. A 3 piece Hello Kitty cookie set was available in adorable special pink box! One of my favorite items is Hello Kitty Cafe Truck’s signature macaron set. I’ve had these several times and they are not only cute but delicious as well. Since it was a beautiful sunny California day, they also were offering their pink bow water bottles to help keep all Hello Kitty fans cool. Aside from the yummy baked goods and refreshing water, they also had Hello Kitty Cafe mugs and t-shirts available. I have one of those Hello Kitty Cafe mugs and using it the morning truly gives me a happy start for the day. They’re perfect for the cup of coffee that you will pair with those yummy Hello Kitty Cafe macarons ;). It was truly wonderful to see the Hello Kitty Cafe Truck visit Del Amo Fashion Center. Del Amo Fashion Center was an awesome place for them to stop because after the sweetness of the truck, it was time for some shopping fun! This South Bay girl was all smiles this Saturday. The cuteness of the Hello Kitty cafe is simply delightful! Now squeezing at the Del Amo Fashion Center is the new bright and happy restaurant, Lemonade. Lemonade is a popular fast-casual restaurant chain serving healthy, seasonal foods, refreshing beverages and sweet treats in a marketplace/cafeteria like setting. There are over 20 locations all around California and this one at Del Amo is the newest branch. The concept at Lemonade is simple and fun. One can mix and match across their menu. The menu consists of items from the various sections: Marketplace, Leafy Greens, Land and Sea, Sandwiches, Hot Dishes and Desserts. As one steps into the Del Amo location, they are greeted instantly by friendly smiles as well as colorful array of fresh cuisine. One is free to browse through the various sections and get samples. Skipping the line to move to one area is also totally acceptable. It’s fast, friendly and fun. The first section of the line is the Marketplace. The Marketplace is actually one of my favorite food sections. This is where they have all their signature seasonal salads. It features a variety of their marketplace vegetables. There are freshly made vegan, vegetarian and protein filled fresh salads. Some items currently at the Del Amo location are the Vegan salads: Hearts of Palm Savoy Cabbage, Red Quinoa and Fuji Apple and Curried Cauliflower, the Vegatarian salads: Kale and Red Pear, New Mexican Chile Roasted Butternut Squash and Shaved Brussel Sprouts and Dates and the protein salads: Pineapple Chicken and Green Beans and the Smoked Tri-tip and Fingerling Potatoes. I got to try the New Mexican Chile Roasted Butternut Squash and the Smoked Tri-tip and Fingerling Potatoes. I was a fan of both Marketplace salads. For the Mexican Chile Roasted Butternut Squash; I really liked the chile lime corn nuts and the scallion ranch mixed in. The Smoked Tri-tip and Fingerling Potatoes was excellent as well. This salad had a healthy mix of tri tip, avocado and potatoes that were all flavored with chipotle vinaigrette. The next section that one will hit in the Lemonade line is the Leafy Greens. Here it is a continuation of healthy veggies but with a focus of salads tossed to order. Currently ready for tossing at the Lemonade Del Amo location are Thanksgiving Greens, Baby Artisan and Gem Romaine and Butter and Red Oak Leaf Lettuces. Up next are the Land and Sea options. Here one can choose from their chicken, beef and fish dishes. There’s poke, ahi tuna and salmon for the seafood lovers. For those who prefer beef and chicken, Lemonade offers a Coffee-Ancho Rubbed Skirt Steak as well as Buttermilk Chicken. I’ve had the Buttermilk Chicken before at another location and could not pass it up here at Del Amo! One can get the Buttermilk Chicken a la carte or get it as a sandwich in the next section which is the Sandwiches section. After the Sandwiches section, one will find themselves at the Hot Dishes area. Here one can get braised, roasted and rotisserie meats and pair them with a variety of hot veggies, chilis, mac and cheese and soups. The savory items in this section are simply amazing. I found myself trying the very drool worthy Soy Roasted Chicken Thighs with Thai chile mango glaze. I had this with Vegetarian Chili and basmati rice. It was very fulfilling and delicious to say the least. The Soy Roasted Chicken Thighs were perfectly tender and the mango glaze gave it a nice, sweet touch. Lemonade does not only do savory but they do sweet as well. One cannot pass up the dessert section here! They’ve got cute “Pick Me Ups;” small jelly jars filled with favorites like Pumpkin cheesecake with chocolate caramel, Lemon Meringue Pie with Graham Cracker Crumble and Chocolate Mint Grasshopper Pie with Chocolate Wafer Crumble. They also have cupcakes, cookies, bars and macarons! The macarons are my personal favorite because they’re gigantic! These treats are sure to satisfy anyone’s sweet tooth. Last but definitely not least, one must try their lemonades here at Lemonade. This place is called Lemonade for a reason. At Del Amo they have the flavors of Old Fashioned, Pomegrante Tarragon, Coconut Apple and Kaffir Lime, Cucumber Mint, Blood Orange and Watermelon Rosemary. Each lemonade is unique and tasty. My personal favorite is the Blood Orange. This one is very refreshing and sweet. Lemonade at Del Amo is a wonderful new addition to the South Bay. With an abundant array of healthy foods; one can easily get a quick yet very fulfilling meal. There is something for everyone here. The place also promotes both healthy and happy. One cannot help but be happy at cheerful and bright place offering fresh dishes. Lemonade is sure to make many smile not only this holiday season but in the next years to come. For more smiles, please see my Yelp review on Lemonade Del Amo. Hello Pink’s Hot Dogs Del Amo! The iconic hot dog restaurant Pink’s Hot Dogs is also now part of the Del Amo Fashion Center Mall family. The original location was a small pushcart by Paul and Betty Pink in 1939 near the corner of La Brea and Melrose. Since that day in 1939, Pink’s Hot Dogs has grown into a worldwide phenomena and has opened up in several locations. From Planet Hollywood Hotel in Las Vegas, NV to Shangri-La Hotel in Manila, Philippines, there’s always a healthy, popular crowd lining up for their legendary hot dogs. The most popular item on Pink’s menu is their original signature chili dog. Though they have quite an amazing line up of hot dogs; they also have several different hamburger offerings as well as onion rings and fries. I, myself had a hard time choosing what item to get when I went to the Del Amo location. The Del Amo location even has their own hot dog named after them. The Del Amo Spicy Polish Dog consists of a spicy polish dog, nacho cheese, American cheese, grilled onions and chopped tomatoes! They have fan favorites here too such as the Mullholland Drive Dog which comes with a 9″ stretch dog, grilled onions, grilled mushrooms, nacho cheese and bacon and the Golden Rings Dog which comes with a 9″ stretch dog, yummy BBQ sauce and topped with onion rings. I actually really enjoy the Golden Rings Dog because it gives you the best of both worlds of a hot dog and a side of onion rings. It’s a messy yet savory hot dog! This location at Del Amo Fashion Center is the first mall location for the iconic hot dog store. It is so wonderful that one can get the taste of Hollywood right at the South Bay and with less of the lines as well! Welcome Pink’s Hot Dogs to Del Amo! Hmm now the only problem for folks is what hot dog to choose?? Bacon Chili Cheese Dog, Southern Belle Dog….hmm the possibilities are endless! Hello Din Tai Fung Del Amo! Another restaurant has joined the already amazing line up of restaurants at Del Amo Fashion Center in Torrance and it is no other than Din Tai Fung. The original Din Tai Fung was founded in Taipei, Taiwan in 1958 as a cooking oil retail shop. It quickly became a full fledged restaurant in 1972 and soon after was known all around the world with numerous branches opening up in United States, Taiwan, Japan, Singapore, South Korea, Australia, Indonesia, Malaysia, China, and Thailand. The newest location in Torrance California marks their fourth restaurant n the Los Angeles area; with the other branches being in Glendale and two in Arcadia. I recently had the pleasure of dining at Din Tai Fung and was simply amazing at their delicious dumplings. I started my meal here with their most popular dish the Pork XiaoLongBao. The Pork XiaoLongBao is a soup dumpling. I learned quickly that there is a particular way to eat it. One must place the dumpling onto your spoon and then poke a hole in the wrapper of the dumpling to release the soup within. One can also dip into soy sauce, vinegar and sliced ginger. I can’t say I’m an expert quite yet in poking the hole in the dumpling properly and getting the juice within, but I can definitely say I am a fan of the XiaoLongBao. The outside wrapper is so perfectly delicate and soft. The pork and soup broth inside the dumpling is flavorful and rich. It is truly a delight. For those looking for a delicious soup, the hot and sour is one of Din Tai Fung’s signature soups. This soup is the perfect mix of sour, spicy and savory. I found it to be very unique because this is the first hot and sour soup that I’ve ever had with noodles. From soups to rice, Din Tai Fung has a variety. The first fried rice I tried here was their chicken fried rice. I love the tender pieces of chicken mixed in the fried rice. This fried rice alone can be a meal on it’s own. The next fried rice I’ve tried was their pork chop fried rice. The pork chop fried rice is actually one of the most popular dishes on Din Tai Fung’s menu. It is topped with long, tender strips of pork chop! Another dish that is quite popular at Din Tai Fung is their rice cakes. Their Vegetarian Shanghai rice cakes was one of my favorites during my visit. The chewy rice cakes and the leafy greens all mixed together in a flavorful sauce was amazing. The dish was light yet very fulfilling. Last but definitely not the least was dessert. I chose to get a sweet taro bun. When this came out, the bun was piping hot and fresh. The steam was coming out upon first bite of this soft dessert. There was a good amount of sweet taro in the bun. Soft, warm and sweet; this was a perfect ending to a great meal at Din Tai Fung. This Hello Kitty Foodie is thrilled with this new addition to Del Amo Fashion Center. Din Tai Fung adds to the already diverse and delicious line up of eateries at Del Amo. I will be back for sure. Back in March 2016, I happily wrote on this blog about Del Amo Fashion Center’s upcoming new eateries. I’m happy to announce that one of the yummy new hot spots has opened up just in time for the summer! That spot is no other than Popbar! Popbar was first founded in New York in 2010 and has since branched out to not only many places in the United States but all over the world as well with locations in Japan, Indonesia, Canada, Russia and South Korea. Here in California, they have branches in Anaheim, Arcadia, Saratoga and now Torrance. The popularity of Popbar perhaps lies its simplicity. It’s fun, quick and creative to create your own pop. Customers start off with choosing your popbar; popGelato, popSorbetto or yogurt pop. Step two is choosing your poppings. Choices for poppings include almonds, hazelnuts, pistachios, caramel corn, coconut, chocolate sprinkles and crushed waffle cone. The third step is to choose your chocolate dippings. You can get a full dip, half dip or drizzle of dark chocolate, milk chocolate, white chocolate, mint dark chocolate or caramel dark chocolate. With three simple steps….tada…out pops up a delicious cool treat! There are 40 flavors always in rotation at Popbar and all of their ingredients are all natural, with no preservatives, artificial flavors or colors. The bars are all gluten-free and the sorbetto is vegan friendly. All the popbars are made fresh daily. I found myself simply delighted with the variety of different popbars that I saw. There was banana, dulce de leche, almond, vanilla, coconut, mango, kiwi and so much more. For my popbar, I chose to get an almond popGelato with a full dip of white chocolate, topped with almonds, crushed waffle cone and hazelnuts and drizzled with dark chocolate. My friend that was with me chose to get a dulce de leche popGelato with a half dip of dark chocolate, a half dip of white chocolate and topping of almonds and hazelnut. The results were two sweet and yummy treats! I really enjoyed my popbar. The almond popGelato had a sweet, creamy texture and the toppings of crushed waffle cone and hazelnuts gave it nice, crisp crunch exterior! It was simple happiness on a stick and a perfect treat for the hot summer day. I am now a certified popaholic. Popbar is a great addition to Del Amo Fashion Center in Torrance. With temperatures creeping up this summer, it’s nice to have a place to enjoy a cool treat with friends. I am not surprised Popbar will also be popping up new locations soon in Costa Mesa, Huntington Beach, Rowland Heights and more. There are endless delicious combinations you can make here at Popbar. Full dip, half dip, drizzle. Nuts or not nuts. Sorbetto or Gelato. Any way you pop, you are sure to smile. For more smiles, please check out my recent Yelp review on Popbar.